Read any history book that traces the evolution of attitudes and approaches to disability (we especially like The Story of Intellectual Disability), and it’s clear that we’ve come a long way. But despite the progress made, there are still so many challenges to overcome—one of them being the biases, misconceptions, and negative attitudes toward disability that still linger in many communities. In today’s post, we offer 11 action steps you can take to help the people in your community fully understand the support needs and potential contributions of young people with disabilities. These ideas are excerpted and adapted from The New Transition Handbook by Hughes & Carter, a great resource for anyone working with students with disabilities as they transition to adulthood. Use these strategies to challenge preconceptions, open minds, and help your community move beyond tolerance and toward acceptance and support of young people with a range of disabilities and needs. Find your people. Start making a list of potential participants in ongoing public awareness activities. Be sure to include many different people: family members, representatives of local businesses that have successfully hired students with disabilities, local talk show hosts who have shown positive, supportive attitudes. Host a social. Once you’ve come up with your list, host a luncheon or social gathering (have students help organize it!) for community support personnel and family members. Getting to know each other informally will help build a collaborative spirit. You can also use this time to brainstorm with participants about ways to increase public awareness of your school’s transition program and foster greater acceptance of people with disabilities. Volunteer as a speaker at special events. Speak at club and community events to raise awareness about the important community contributions of organizations dedicated to the needs of people with diverse abilities, such as the local People First or Self-Advocates Becoming Empowered chapter. Encourage visibility. If your students take visible roles at public events, community members will see the contributions of people with disabilities firsthand, without having to come to your school. Encourage high-visibility student participation in a number of community activities. For example, a student could serve as an usher at a city play, work on a neighborhood cleanup committee, or volunteer at the local chamber of commerce. Start a discussion group. Host a small discussion group with parents, self-advocates, and community members. Discuss key issues that touch the lives of students with disabilities, including communication, expectations, misunderstandings, levels of acceptance, and methods for promoting acceptance among all people. Invite and involve community members. Send them invitations to visit your school and see the types of educational and career development experiences you’re providing as part of your transition program. They may discover that your students are well trained in their area of business, which could lead to employment opportunities. To address the full range of your students’ needs, you might also invite key community members to transition and multidisciplinary team meetings. Present a program. Develop a clear and compelling informational program about your students that can be delivered at various meetings attended by community members. For example, an engaging slideshow or video can be a very useful tool to communicate the objectives of your school’s transition program and the skills and talents of the students involved. Get on the calendar. Does your community have an online calendar to highlight upcoming programs and events? Contact them well in advance so they can include public awareness events taking place in your school. Make the news. Solicit community support for people with disabilities through articles in your school newspaper, parent newsletter, or local newspaper. Talk to your television or radio news station about doing a brief human interest segment on your public awareness program. Plan a training session. Together with fellow educators and staff members at your school, plan an in-service session that teaches community members and employers about positive, appropriate ways of interacting with people with disabilities. After a training session like this, you may find that some of the participants volunteer to mentor your students. Model appropriate interactions. Modeling is one of the most powerful ways to promote greater awareness and acceptance. Make appointments with local employers and organizations to demonstrate appropriate interactions with people who have disabilities. You might demonstrate how easy and enjoyable it is to talk with an employee who uses a communication board, or how to provide appropriate accommodations for an employee with intellectual disability. Once you model these interactions, community members will feel more confident that they can do it, too. 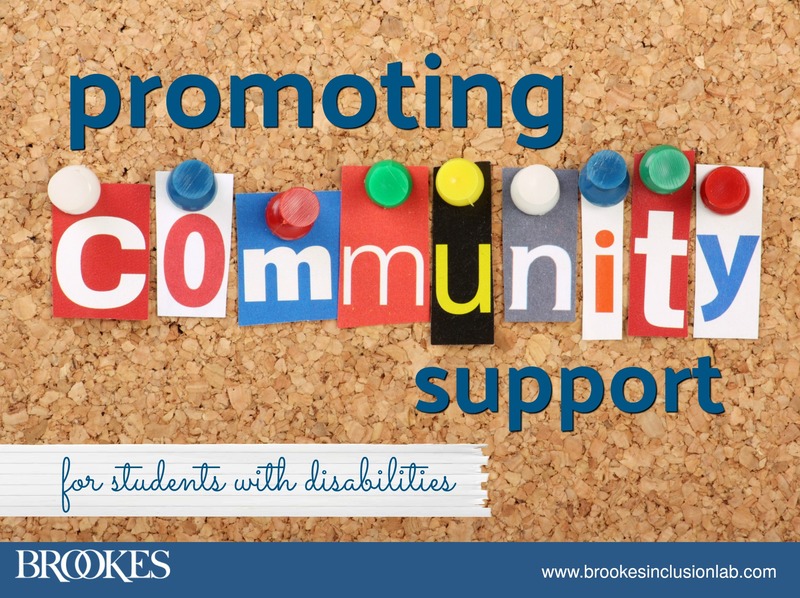 Using these strategies as a springboard, you can help dismantle stereotypes and biases, promote community awareness of the needs and contributions of young people with disabilities, and gather support for your school’s transition program. Have another idea for raising community awareness? Add it in the comments below! The New Transition Handbook by Hughes & Carter gives you more than 500 research-based, teacher-tested strategies that help students with disabilities make a smooth transition to adulthood.